If $A$ has coordinates $(x_1, y_1)$ and $B$ has coordinates $(x_2, y_2)$, then the midpoint of $A$ and $B$ is said to be a point $C$ that cuts the distance between $A$ and $B$ into 2 equal parts. 1. Calculate the midpoint of $(2, 1)$ and $(0, 9)$. 2. Calculate the midpoint of $(-5, 6)$ and $(2, -4)$. 3. Given the points $(0, 4)$ and $(0, 10)$, show that $(0, 7)$ are the coordinates of the midpoint without using the midpoint formula. 3. We note that all three of these points lie on the line $y = 0$. We note the distance between $(0, 4)$ and $(0, 10)$ is 6. Furthermore, we know that the distance between $(0,4)$ and $(0, 7)$ is 3, and the distance between $(0, 7)$ and $(0, 10)$ is 3. 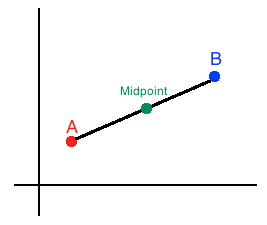 Since $(0, 7)$ splits the distance between the first two points in half equally and lines on the line segment of the distance between them, $(0, 7)$ must be the midpoint.